In artillery, caliber or calibre[nb 1] is the internal diameter of a gun barrel, or by extension a relative measure of the length. Rifled barrels introduce ambiguity to measurement of caliber. A rifled bore consists of alternating grooves and lands. The distance across the bore from groove to groove is greater than the distance from land to land. Projectiles fired from rifled barrels must be of the full groove to groove diameter to be effectively rotated by the rifling, but the caliber has sometimes been specified as the land to land diameter before rifling grooves were cut. The depth of rifling grooves (and the consequent ambiguity) increases in larger calibers. Steel artillery projectiles may have a forward bourrelet section machined to a diameter slightly smaller than the original land to land dimension of the barrel and a copper driving band somewhat larger than the groove to groove diameter to effectively seal the bore as it becomes enlarged by erosion during prolonged firing. United States Navy guns typically used rifling depth between one-half and one percent of caliber. Projectile bourrelet diameter specification was 0.015 inches (0.38 mm) less than land to land diameter with a minus manufacturing tolerance so average clearance was about 0.012 inches (0.30 mm). Driving band diameter was groove to groove diameter plus 0.02 inches (0.51 mm). The length of the barrel (especially for larger guns) is often quoted in calibers. For example, US Naval Rifles 3 in (76 mm) or larger. The effective length of the barrel (from breech to muzzle) is divided by the barrel diameter to give a dimensionless quantity. :81 As an example, the main guns of the Iowa-class battleships can be referred to as 16"/50 caliber. They are 16 inches in diameter and the barrel is 800 inches long (16 × 50 = 800). This is also sometimes indicated using the prefix /L; so for example, the most common gun for the Panzer V tank is described as a "75 mm /L70," meaning a barrel with an internal bore of 75 mm, and 5,250 mm long (17 ft 2.69 in). 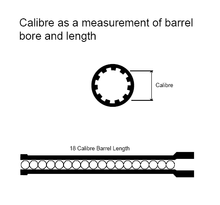 The bore to barrel length ratio is called caliber in naval gunnery,:81 but is called length in army artillery. Before World War II, the US Navy used 5"/51 caliber (5"/L51) as surface-to-surface guns and 5"/25 caliber (5"/L25) as surface to air guns. By the end of World War II, the dual purpose 5"/38 caliber (5"/L38) was standard naval armament against surface and air targets. All three had a bore diameter of 5 inches (not 5.51 or 5.25 or 5.38 as often misread). Naval rifles, although constructed and manufactured in roughly the same manners as land based artillery, were built to much more stringent and studious standards than land based weapons, and for good reason. At sea, a weapon had to perform, without fail. There was no ready replacement, nor one that could be readily supplied. Over time, the terms of pound (weight of shell) and bore (the actual bore of the weapon) became confused and blurred. Eventually, when the technology existed, the bore (in inches or millimetres) came to be the standard measure. For naval rifles, the initial change was to actual bore, thus facilitating the manufacture of standard projectiles. They then began to measure the effective length (and therefore range) of the weapon in calibers. These are a measure of the standardized bore of the barrel versus the rifled bore of the barrel. In other words, a 12/45 is 12"×45= the length of the rifled bore of that gun in inches. This explains the differences in both penetration and long range performance of various naval rifles over the years. In addition to the possible improvements in overall performance (i.e. muzzle velocity and striking force), the increase in barrel length also allowed, in some circumstances, an increase in projectile size as well. For example, the American 14/45, as introduced in the New York-class battleships, fired a 1250 lb. projectile. Later improvements to the design, lengthening the rifle itself and also altering the breech, allowed a 1400 lb. projectile and, overall, a greater barrel life. Again we see this pattern with the US 16" guns. The initial design was 45 calibers in length and fired a 2200 lb. shell. The later re-design to 50 calibre not only allowed a higher velocity but also a heavier 2700 lb. shell, which ultimately came to be accepted as the greatest naval shell ever deployed in combat. Early gun barrels were short and thick, typically no more than 26 calibers, as the gunpowder propellant they used burned very quickly and violently, and hence its acceleration time was short. Slower-burning "brown powder" formulations of gunpowder allowed gun barrel length to increase slightly in the 1880s but enormous quantities of brown powder were required. New slower-burning "smokeless powder" propellants available from the 1880s onwards such as Poudre B, cordite and nitrocellulose allowed a gentler prolonged acceleration, hence gun barrels were made progressively longer and thinner. The new formulations were far more powerful propellants than gunpowder and far less was needed by weight as they transformed almost entirely to gasses when burned. Muzzle velocity became limited only by the length of barrel that was feasible, both in terms of the construction methods of the day and in terms of any practical constraints imposed by the gun's manner of use. The practical effect of long barrels for modern guns is that the projectile spends more time in the barrel before it exits, and hence more time is available for expanding gas from the controlled burning of the propellant charge to smoothly accelerate the projectile, bringing about a higher velocity without placing undue strain on the gun. In internal ballistics terms, if the base of a projectile is thought of as a piston propelled by the expanding gas, then as barrel length increases the volume swept by the piston also increases, and hence the amount of energy that can be extracted from the gas's burning increases. A longer barrel allows more propellant to be used: the propellant is all burned fairly early in the projectile's journey along the barrel, except in the very common instance where combustion is still occurring as the projectile leaves the muzzle and a visible muzzle "flash" is produced. The projectile continues to accelerate as long as the pressure behind it is sufficient to overcome bore friction. The excess energy will continue to accelerate the projectile until it exits the muzzle. If the pressure behind the projectile drops sufficiently before the projectile leaves the bore, the projectile can and will slow while still within the barrel, despite residual bore pressure behind the projectile. A light charge with insufficient pressure to expel the projectile will result in a "squib", or projectile lodged in the bore. This pressure is reduced by the increasing barrel volume the gas has to fill, and in order to achieve maximum muzzle velocity with the shortest barrel length, the projectile should exit the barrel as the gas pressure reduces to a small fraction of the maximum, although unlike chamber maximum chamber pressure, the small fraction desired is impossible to measure. In modern guns, increased muzzle velocities can be produced by altering powder composition and/or using duplex charges containing two different powders in order to extend the "pressure curve" further down the bore. By exposing the projectile base to a given pressure for a longer length of time, velocity can be increased without elevating the pressure level generated. Technological improvements had made it possible to introduce into use long gun barrels that are strong enough to withstand the forces involved in accelerating the shell to a high velocity, while remaining light enough to be reasonably mobile, rigid enough to maintain accuracy, and having a bore able to withstand many firings before needing refurbishment. In World War I 45-caliber naval gun barrels were typical, in World War II 50- to 55-caliber barrels were common, with Germany already manufacturing tank guns of 70 calibers by 1943. Today 60- to 70-caliber barrels are not uncommon, but the latest technology has allowed shorter barrels of 55 calibers to attain muzzle velocities of 1,750 m/s (5,700 ft/s), as with the Rheinmetall 120 mm tank gun. However, by using discarding sabots, many such guns fire projectiles which are much smaller than the gun bore; so the relationship of projectile size to barrel length is not as straightforward as with older ordnance. ^ Fairfield, A.P. (1921). Naval Ordnance. Annapolis, Maryland: United States Naval Institute. pp. 501–508. ^ a b c Naval Ordnance And Gunnery, Volume 1, Naval Ordnance, NAVPERS 10797-A (1957 ed.). Washington, D.C.: U.S. Navy, Bureau of Naval Personnel. 1957. p. 81. ^ Rowland, B et al. ^ Gun Mount and Turret Catalog (OP 1112, 1945 ed). ^ FTP-45 (General Fleet Tactics 1924). ^ FTP-188 (General Fleet Tactics 1940).